By all accounts, the decline of the US Dollar has been measured, and without incident. This, despite the fact that most investors reckon the Dollar is doomed, both from a long-term and a short-term perspective. What, then, is preventing an all-out collapse? Personally, I think the best answer is that Central Banks (and their sponsoring governments) don’t want the Dollar to collapse. In other words, a schism is forming between private investors and public government, whereby investors (on a net basis) are rooting against the Dollar, while Central Banks are rooting for it. That’s not to say that there is a global conspiracy involving Central Banks, designed to prop up the Dollar. Rather, it is that Central Banks are simply trying to protect their short-term financial interests, and long-term economic interests. By this, I mean simply that foreign Central Banks have everything to gain from a strong Dollar, and seemingly everything to lose from its collapse. Meanwhile, Central Banks in industrialized countries are using increasingly strong rhetoric to try to talk down their currencies. The Banks of Canada and England have achieved modest success in the last few weeks in convincing investors that overvalued currencies would be met with decisive action. The Royal Bank of Switzerland has intervened several times, while the European Central Bank has expressed concerns about “volatility” (code for the rapid appreciation in the Euro) in forex markets. It’s still not clear where the Bank of Japan stands. The newly appointed Finance Minister has already flip-flopped several times, settling finally on a course of action that would prevent the Yen from rising too high and threatening the nascent recovery. In other words, continued foreign Central Bank investment in US Treasury securities is perhaps rooted less in investment strategy, then in the simple desire to prevent their current holdings from depreciating. At the same time, those banks that intervene directly in forex markets often have little choice other than to hold their forex reserves in US Treasuries. You can see from this that the idea of an alternative reserve currency would actually run counter to the interests of many of these Central Banks. With the exception of a few (i.e. Iran, and to a lesser extent, China) that would like to see the Dollar fail for political reasons, the vast majority of banks have a vested interest in the Dollar remaining where it is. Otherwise, they would witness the value of their Dollar-denominated assets collapse, as well as a collapse in exports to the US. It looks like, then, there will be a showdown at some point between the Central Banks and investors. If you accept the notion of efficient markets, then it should be obvious who will win in the long-term. On the other hand, you can’t underestimate the determination of some of these banks. still the same old consolidation of assets in the durables , no new wealth creation apparent yet for new money creation recovery , as we see Buffet acquire Burlington railways . “On the other hand, you can’t underestimate the determination of some of these banks.” Quite. They are certainly able to go against the markets for sometime. The British Pound continued to be the currency of choice long after the decline of the British Empire and the rise of America and the USSR as the new superpowers. 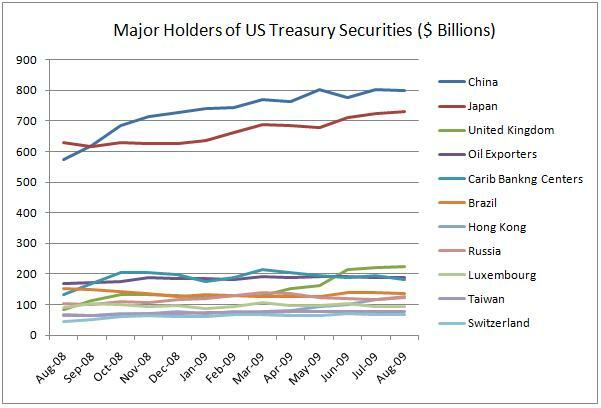 It really is an eye opener to see how much China and Japan are invested in the US. It would appear that these foreign countries own the US on a sort of monetary scale. I suppose a foreign country would not want thier investment to fail. The “Royal Bank of Switzerland” sounds funny… not being Swiss, of course. Men the other day I was watching the news at my platform like I always do, everything was normal and all of the sudden, and both Bloomberg and broker ACM news started to go crazy with gold!!! Hit new year high!!! Very nice article. I am just wondering what will investors trade if USD will go down or will be replaced with universal currency? there is no royal bank of switzerland…. there is the swiss national bank…. It is my observation that what is happening now is that central banksters around the world are intervening the dollar, buying dollars to protect export, dollar based debt, and their economy. However they understand that the only thing they can do is slowing this process of $ devaluation that will inevitably happen, so at the same time they hedge to a certain extend this unwanted $ exposure by buying gold. Obama has printed money as fast as the printers will operate yet Those God awful banks have refused to Loan it out, ironically saving the Dollar! the market with dollars right now would just make things worse! banks to just stay away from more Goverment interference!